This resource features the general description of a mine section where a section of uncharted tunnels was discovered. 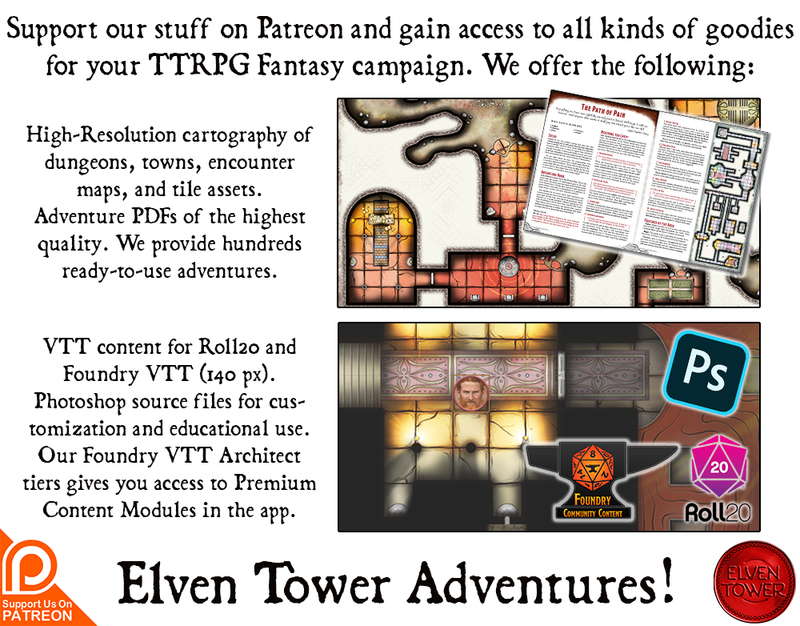 It includes adventure ideas that are appropriate for mid-level (Levels 6 to10) adventur­ing parties. Challenge Rating (CR) is calculated using a party of four as the model. Harnnes is a small town by the fringes of the province. A couple of dozen houses hug each other next to a great cliff face. People are poor in general around this area. The soil is not farmable, at least not enough to make it profitable. Only a few people in Harnnes do subsistence farming and sometimes they do not make enough to make ends meet. The only real reason why people cling to this forgotten piece of land is the mine. They call it “Old Dan’s Mine” in honor of Dan Silveste who was one of the first settlers almost one hundred and fifty years ago. Dan moved here with a few other families under the promise of a profitable mining operation. It was successful as they found a vein of silver and platinum which enriched Silveste and a few other townsfolk. Unfortunately, the mine’s rich veins and deposits seem to have run out about thirty years ago. Whatever coin was left eventually ran out and some families moved back to the closest city, which is a few days away. The remaining townsfolk continue working the mine to this day. It is not as rich as before, but they manage to mine enough silver and coal to survive. Things took a turn for the better a few weeks ago. Harry Silveste, a descendant of the original owner of the mine, now works as a surveyor and geologist. He decided to expand a mining tunnel in a different direction and found what appears to be a large vein of silver. Harry and his miners still do not know how big the vein is but it appears to be big enough to boost the town’s production fivefold for a year or two. A few weeks later, the miners expanded the rail line and began mining. It was then that they had a second discovery. After blowing a few explosive charges, The sidewall of a tunnel collapsed and revealed a strange passage next to their mining operation. The passage appeared to be of artificial origin because it leads to a descending shaft with carved stairs appropriate for human use in size. Harry Silveste gathered a few strong men and went down the tunnel to explore. After some exploration, Harry determined that the tunnel was dug by drow explorers from the Underdark. This was his conclusion after he found some marking in elvish in the entrances of some tunnels. It all appeared as if the drow were in the middle of digging a new way out of the Underdark to the surface. It just so happened that their tunnel intersected with their own mining tunnel. Harry Silveste and his people did not return home that night. They were ambushed by a group of savage creatures. They were bipedal, furry, and simian (quaggoths). Silveste did not miss the two drow who saw it all from the shadows. They were all taken prisoners by the drow explorers. They moved them down to a complex set of caves under the mine. Harry Silveste is an educated person and he knew elvish well enough to understand the speech of his captors. What he found out is not good news. 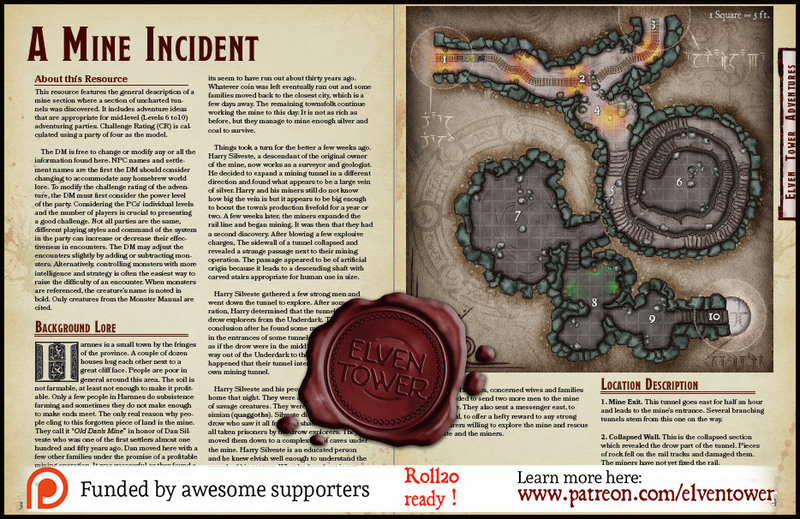 The drow plan to simply leave Silveste and his men’s fate to the quaggoths. They are meant to become food for the next week. Back in Harnnes, concerned wives and families have decided to send two more men to the mine to explore. They also sent a messenger east, to the capital, to offer a hefty reward to any strong adventurers willing to explore the mine and rescue Silveste and the miners. Mine Exit. This tunnel goes east for half an hour and leads to the mine’s entrance. Several branching tunnels stem from this one on the way. Collapsed Wall. This is the collapsed section which revealed the drow part of the tunnel. Pieces of rock fell on the rail tracks and damaged them. The miners have not yet fixed the rail. Mine Depths. This tunnel leads north and continues for ten minutes to the new silver vein. Two branching tunnels stem from this one on the way. Miner’s Camp. 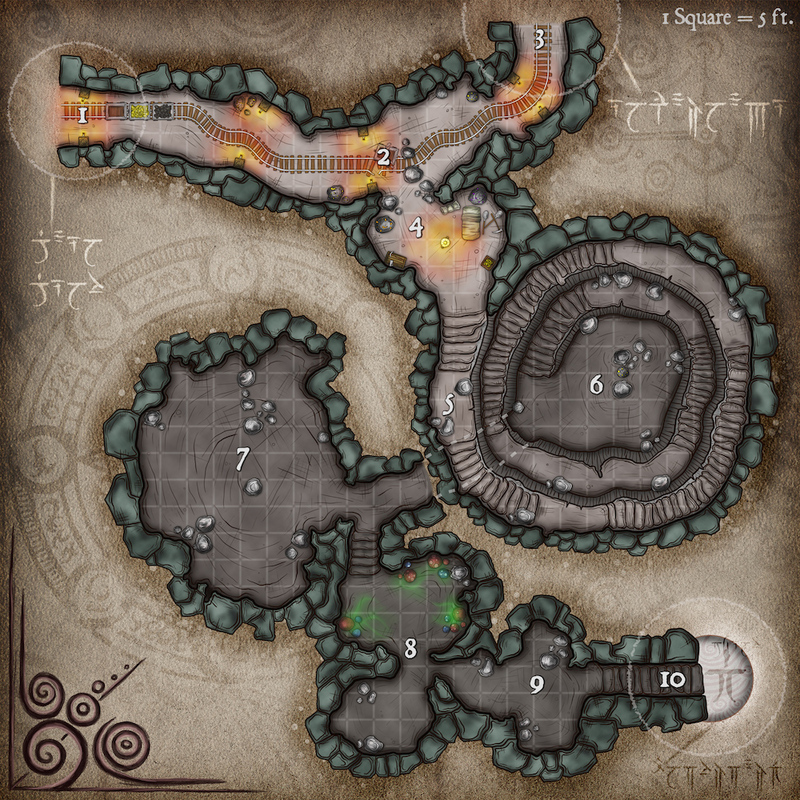 Silveste and his men set this camp up as a middle point for the deeper part of the mine and the recently discovered drow tunnels. There is nothing of value here, except the lamp. Descending Steps. The shaft descends 50 ft. The spiral stairs are uneven, wet, and dangerous. 6 swarms of bats attack any visitors as they start descending the stairs. Any creature that takes damage must succeed on a DC 11 Dexterity saving throw to avoid slipping on the wet stone and become prone. A failure by 5 or more causes the creature to fall down to the next landing or the bottom of the shaft, taking 7 (2d6) bludgeoning damage. Shaft’s Bottom. The bottom of the shaft features a tunnel entrance with several markings in elvish. The markings are digging instructions and tallies of workers. A passive Perception score of 17 or higher or a successful DC 17 Wisdom (Perception) check reveals several droplets of dry blood on the rough stone floor. Someone was injured here only a few days ago. Drow Ambush. Following the same successful strategy, a group of 2 drow and 4 quaggoths hide here when they notice new visitors approaching. They will not continue their way up now that they have found resistance. They know that the surface is very close but they need further instructions. One quaggoth was sent down to the next drow encampment to ask a superior about their new course of action. Fungi Garden. The fungi in this area are dangerous. The drow planted them here for protection. They and the quaggoths have all inoculated themselves against the toxin and are not affected by it. Any other creature that approaches within 10 ft. of the fungi must make a DC 14 Constitution saving throw. The creature takes 13 (3d8) poison damage and becomes poisoned on a failed save, or half as much damage on a successful one.9. Prisoner Camp. Underdark Access. This tunnel continues down and branches into untold caverns that lead to the Underdark. These are the general features of Old Dan’s Mine. The mine is currently operational but all activities were stopped temporarily until the infestation problem is solved. Terrain. Both the mine and newly discovered cave are of artificial origin. The soil is rough and undeveloped. Rubbish and broken rock pieces make movement difficult in certain areas. Light. The mine tunnel is brightly lit with torches in sconces in every support beam. Area 4 is well lit by an oil lantern. Area 8 is dimly lit by the bioluminescent fungi in the area. All other locations are in complete darkness. Smells and Sounds. The smell of raw coal, wet soil, and burning oil are present in the mine tunnel and Area 4. Area 8 features a pungent acidic smell from the poisonous fungi in the area. A successful DC 12 Wisdom (Perception) check reveals this smell as far as Area 7. Poisonous Fungi. Approaching within 10 ft. of the poisonous fungi in Area 8 is dangerous. A creature who gets that close must make a DC 14 Constitution saving throw. The creature takes 13 (3d8) poison damage and becomes poisoned on a failed save, or half as much damage on a successful one.